I found it at Advanced Auto. It's near the naval jelly. Thanks Christine. I'll check out our auto supply when I go into town...... 30 miles from town so we don't go often. You might call to make sure they carry it. I tried 3 hardware stores and 1 other automotive store before I found it at Advanced Auto. Everyone carries naval jelly, but you can't use naval jelly on chrome. Evaporust is safe even for bare hands. And it does a great job on the rust, I was amazed when I saw the results. Skip, great tut, as always. I so appreciate your advice. I'm wondering though where to look for evaporrust. My DH and son left some fishing lures down in the boat last week and the hooks got rusty from the heavy rain that came down. I'm thinking that soaking the hooks in evaporrust might be the solution to the problem. If the hooks aren't sharp (and rust sure makes them dull) the fish don't get caught. I've got to find a way to get the rust off. Then, I can use evaporrust on the machines I find as well. Is there a method of treating the cracked paint on an old machine? I found a 201K (with the light mounted on the back ) and it must have been in the heat at one time in it's life. The paint is japaning (why is it called japaning, by the way?). It should arrive in a week or so. I want to fill in the cracks where bare metal is showing through. I have been pondering this issue. I am finding that lacquer stabilizes and fills in cracks better than the shellac. That is not to say that the final coat can't be shellac to give the machine all the authenticity that is desirable. I am working and nearly finished with a 201-2 that was in horrible shape. I will post but I like the results. The main issue is the decals. I don't trust the french polishing with them, and yes, I did see your strategy for dealing with them. If you lacquer, they are safe forever and then you can shellac over the lacquer. Let's keep in mind that these machines are 50 to 75 years old on the average. I think that you can get a nicer result if you don't have to worry about the decals, and also the finish will be very smooth. I'd be interested to know your thoughts. I know that a purist would probably disagree with this, but we are doing reverse engineering. Clearly, Singer put on the decals after the machine was shellacked and hence the problems we now face. To shellac over them really is not authentic either, so I err on the side of preserving the decals as best I can. Lacquer is difficult to use. I spray it with a compressor and get decent results, then sand, then will apply the shellac. Just some thoughts. Last edited by DanofNJ; 07-15-2012 at 07:54 PM. Dan, I see your points, but disagree. The decals are exactly that...decals. If they were put on after the clear coat (shellac) you would have the edge ridges, ever so slight, but still there. If you look at where the decals are most often missing, it's on the cross bar, where people either had a pin cloth wrapped around it and/or grabbed the machine to raise/lower in and out of the cabinet (or lift it for whatever reason), or on the bed where hundreds of yards of fabric passed. Shellac can and does protect the decals and the finish on the machine. In most cases, I'm not a purist, but I'll stick with Skip's method. Shellac is extremely forgiving!! One day, you'll only be a memory for some people. Do your best to be a good one. But...Shellac, especially French Polishing can be touchy. especially for the beginner. If, and we have all gone through a bad shellac experience, it has to be removed, the process of removing to shellac to redo will fade or destroy the decals because they are not happy with shellac being "rubbed" off of them. Then you have nothing but a mess and destroyed decals which in most cases cannot be replaced. Glenn is an expert....so the likelihood of this happening is lessened, but for the average person trying to restore a machine for the first time it will end in disaster. If there is a lacquer base, you can rub shellac off and on the machine all day with no fear of damage because lacquer is not dissolved by the alcohol. With that said, I do very much respect Glenn's expertise and he could work on one of my machines anytime . I also agree that shellac is very forgiving. Just one note as well, by lacquer I do NOT mean automotive clearcoat which is basically plastic. I mean regular lacquer. As noted, I will post my latest project as a hybrid of Glenn's technique. Well, we are pretty average and did it. Yes I am a purist and will not use lacquer on a machine. I disagree, shellac was applied over the decals after application to protect them and make them smooth with the bed. I have also used lacquer with good results but don't like it. Lacquer is difficult for the average home owner to do correctly so I don't recommend it. Yes I have been doing this for a long time and it comes easy but it is something the novice can do with not much problem. You can do a tut on you technique maybe a member would like to try in on one of their machines. As for me I will stick to the original finishes and proven antique restorations technque for the cabinets and the machine. Looking forward to seeing some of your work and continue the debate on different techniques. I have only used "The Method" on one machine so far, and with that one, knowing that shellac was missing over the decals, I cleaned and then dabbed shellac over the decals before I started the French Polish...that was I knew I wasn't going to be messing anything up! Hello there. 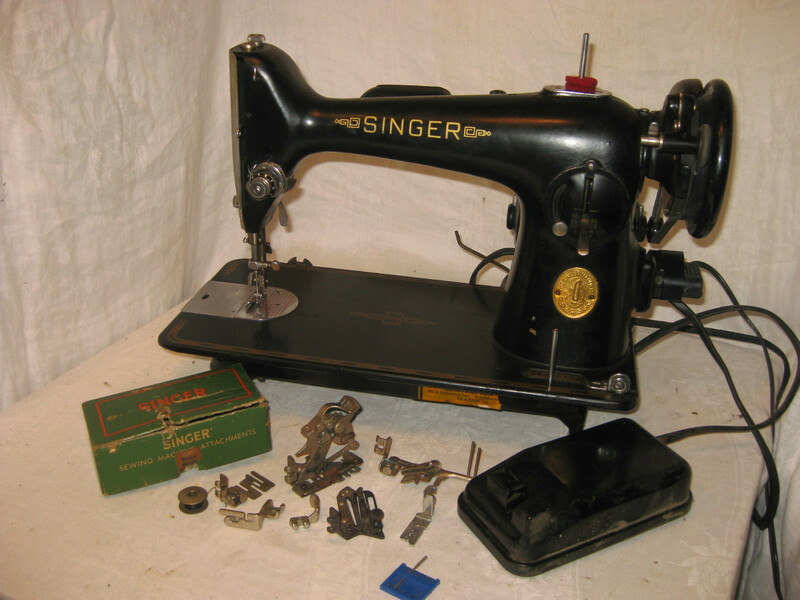 I am a beginner to working on old sewing machines, and quilting as well. I am not quite a beginner with sewing, my mom started me out with her sewing machine when I was maybe 9 or so. 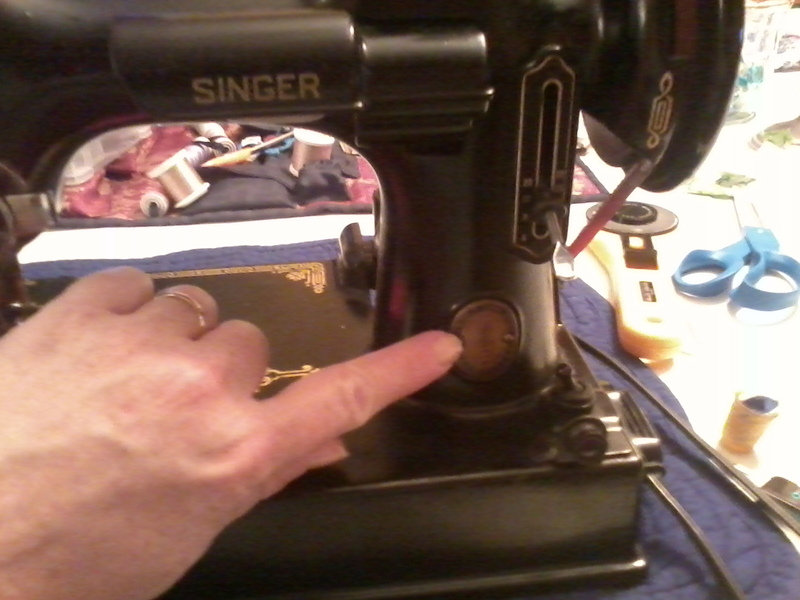 My mom had an old Singer treadle when I was little. I used to love it when she would open it up to show our friends how it worked. We had to sell it when we moved, unfortunately. I don't claim to be an expert, but I know enough to be dangerous! Anyhow, this week I did something completely crazy and brought home a Davis treadle vertical feed machine... the belt is gone, there's a bit of rust here and there, and the finish is of course a lovely orange-peel texture on the bed of the machine. The good news is when I turn the hand crank the needle and foot move like they ought to, and the shuttle also. I'd like to make this old beauty shine again. I may be overly optimistic, but I think I can get her working again. Should I use this technique with orange-peel textured crackled finish? Or is there something I should do first to protect the remaining decals? I've cleaned off the head some with sewing machine oil and gently wiping with a soft cloth. I just really don't want to damage the decals. I know my chances of actually damaging the body are laughable, unless I did something evil and left it outside in the rain. jump in with both feet and see if cleaning it works OR leave it as-is with regards to the paint, and just work on getting the mechanics running smoothly. I want to make sure when I choose, it is an educated decision. Any personal experiences or links to more Davis-related resources greatly appreciated! I watched Muv's tutorial and she mentions metal poslish. Can I use metal polish on this medallion? It says (in part) "a century of sewing service, 1851-1951." Yes, you can polish this with brasso and it will be very pretty. You are awesome at this!! Be careful when putting Brasso on the medallion, you don't want to remove the blue paint from the Centennial badge. I like to make lists. I also like to leave them laying on my sewing table and then guess what's on the list while at the fabric store. Fun game. I am excited to see how that Davis turns out! It is a PERFECT candidate. Dan, I understand your position. Skip's method is amazing and I've used it multiple times. 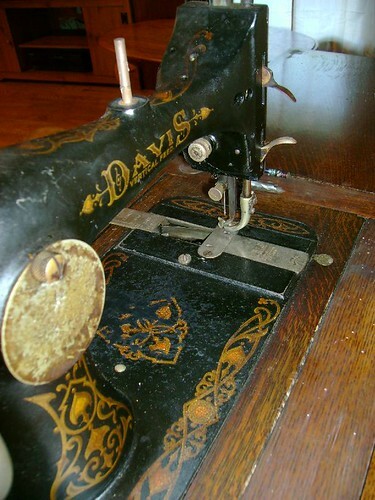 In fact, I'm going to try and save what is left of the finish on my Alvah National (my very first treadle). On the flip side, I am using non-traditional finishes on the woodwork. Wipe-on poly is my finish of choice because I know life happens! None of my cabinets ever have decent finishes when I get them. Sometimes, I spend more time gluing down lifting veneer than working on the head! Like Skip says, make your own tutorial! I'm not very skilled with metal/paint finishes so I'll be sticking with the French Polish method for the heads. It will be very interesting to contrast the two methods. Right now, I'm avoiding buying machines with cracked paint. Could you start with one of those? This is my 201k. The ebay auction showed the paint was cracked, but it's not as bad as I had expected. The shellac is cracked some but it's not down to bare metal. In fact, the cracking is minimal and I'm not going to do anything to it. Notice the light is attached to the back! Yipee! I'm going to rewire the entire machine, the wiring is in bad shape. And then I'll put it in a table. Our Lowe's store carries evaporust but it is in with cleaning supplies near the naval jelly. I am trying to fix up my Davis, and it is looking better... the black areas no longer have that icky sticky orange peel texture, BUT, some of the areas with the decals seem stubborn, and despite going very slow and cautious, I ended up with a bit of silvering. It may be the damaged shellac is adhered so strongly to the decals that anything affecting the shellac will damage the decals. Talk about a catch-22. It's made me nervous to continue! I have been focusing instead on cleaning and rust-removal of the metal pieces.